Required: Code will always run in a transaction. Create a new transaction or reuse one if available. Requires_new: Code will always run in a new transaction. Suspend current transaction if one exists. Isolation Defines the data contract between transactions. An isolation level is about how much a transaction may be impacted by the activities of other concurrent transactions.It a supports consistency leaving the data across many tables in a consistent state. It involves locking rows and/or tables in a database. Scenario 1.If the T1 transaction reads data from table A1 that was written by another concurrent transaction T2.If on the way T2 is a rollback, the data obtained by T1 is invalid one.E.g a=2 is original data.If T1 read a=1 that was written by T2.If T2 rollback then a=1 will be a rollback to a=2 in DB.But, Now, T1 has a=1 but in DB table it is changed to a=2. Scenario2.If a T1 transaction reads data from table A1.If another concurrent transaction(T2) update data on table A1.Then the data that T1 has read is different from table A1.Because T2 has updated the data in table A1.E.g if T1 read a=1 and T2 updated a=2.Then a!=b. Scenario 1 is called Dirty reads. Scenario 2 is called Non-repeatable reads. Scenario 3 is called Phantom reads. So, isolation level is the extent to which Scenario 1, Scenario 2, Scenario 3 can be prevented. You can obtain complete isolation level by implementing locking.That is preventing concurrent reads and writes to the same data from occurring.But it affects performance.The level of isolation depends upon application to application how much isolation is required. ISOLATION_READ_COMMITTED: Allows reads from concurrent transactions that have been committed. It may suffer from Scenario 2 and Scenario 3. Because other transactions may be updating the data. ISOLATION_SERIALIZABLE: Scenario 1,Scenario 2,Scenario 3 never happens.It is complete isolation.It involves full locking.It affects performance because of locking. --> Stack is the collection of objects accessed from one end. eg. pile of the plate in the kitchen. It has two primitive operations are: Push for addition and Pop for deletion. All the operation are on the top of the stack. -define the size of the stack. - define the top of stack -1. -push(n): it will push the element into the stack. -If there is no more space to push element in the stack, the stack is full!!! -remove an element from the top of the stack. eg n = pop(). -if the stack has no more element and tried to remove the element. the stack is empty!!! CountDown latch is one of the kinds of synchronizer which wait for another thread before performing the tasks or This is used to synchronize one or more tasks by enabling them to wait for the tasks completed by other tasks. 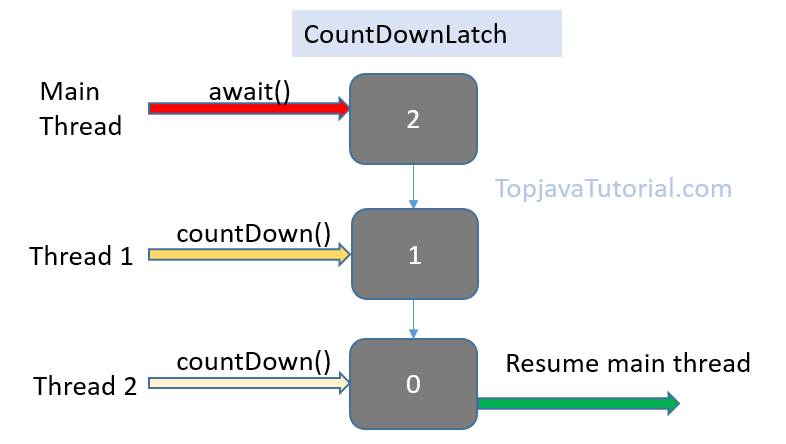 It was introduced in Java 5 along with other CyclicBarrier, Semaphore, CuncurrentHashMap and BlockingQueue. Its somehow like the wait and notify but in the more simpler form and will much less code. It basically works in the latch principle. Or let us suppose we have a seller who is going to sell 10 (No. of operations) apples. The number of customers may be anything but what the seller is concerned about is the number of apples because when it reaches to 0 he can go home. The seller(Main Thread) will wait for the customers (awaits()). Let's say there are 10 customers(Threads) now who are in the line to buy Apple. When one customer buys that Apple then the number of apple decrease by 1 (countdown()) and another customer will get a chance to buy that apple so on the number of apples goes on decreases and finally become 0. After no apples left in the bucket, the seller can stop selling and go home happily. Note:: In CountDown Latch the countdown cannot be reset. We're making our request to Unsplash, it's returning a response that we're then converting to JSON, and now we're seeing the actual JSON data. Fantastic! All we need to do now is display the image and caption on the page. Each one of these functions in turn calls jQuery's main .ajax() method. These are called "convenience methods" because they provide a convenient interface and do some default configuration of the request before calling .ajax(). Let's look at the .get() and .post() methods to see how they just call .ajax() under the hood. Running an asynchronous request in the console. The request is for a resource on SWAPI. The request is displayed in the network pane. So we can make a request with .ajax(), but we haven't handled the response yet. Zookeeper is one of the famous apache's projects which is used to provide synchronized services across the servers i.e. it's a centralized infrastructure. It is very hard to manage and coordinate the different cluster at a time but zookeeper with its advanced API with the simple Architecture solves this issues. With the help of zookeeper, we can focus more on development rather than managing the clusters. Zookeeper does this by creating a file in its server known as znode, which resides in the memory of zookeeper. This node can be updated by any nodes in the clusters to update their status. This updated status can be gained by other nodes so that they can change their behaviors to provide the perfect services. What are topics and partition in Kafka? Topics are nothing but a particular stream of data. It is just like the table's in the database except without all the constraints. We can have as many topics as we want. Like in the database each topic is identified by its name. Similarly, topics are splits into partitions and each partition is ordered. Each message in the partition gets an incrementing id which is called offset. so here the combination of these partitions[Partition0, Partition1, partition2] is called a TOPIC. Offsets in one partition don't mean anything to other partition, Eg: offset 2 in Partition1 will be the same with offset 2 in other partitions. Orders are guaranteed only within the partitions. Once the data is written in the partition it cannot be unchanged i.e. it is immutable. We push data to the topic, not the partitions. Unless we provide the key data is randomly assigned to the partitions. We can have as many partitions on the topic we want. Now it looks much better. Use := to replace var and type, this is called a brief statement. its simple but it has one limitation: this form can only be used inside of functions. You will get compile errors if you try to use it outside of function bodies. Therefore, we usually use var to define global variables. NOTE: GO will give compile time error if we didnt use the variable which are already defined. Go or golang is the new programming language developed by google for their most roboost and to manage the large scale application. It is lightweight and more managable and is awesome for the web services and last but not the least it is easy to learn. InBuilt concurrency support: light-weight processes (via goroutines), channels, select statement. Support for Interfaces and Type embedding. Production of statically linked native binaries without external dependencies. 2. then we bind the html input with the user object which is in the component. 4. in the form we use (ngSubmit)="onSubmit()" to submit the form and #f is used to hold the form. 5. once submitting the form we will display the form value in the console. 1. Only allow submission only when all the form data is valid. 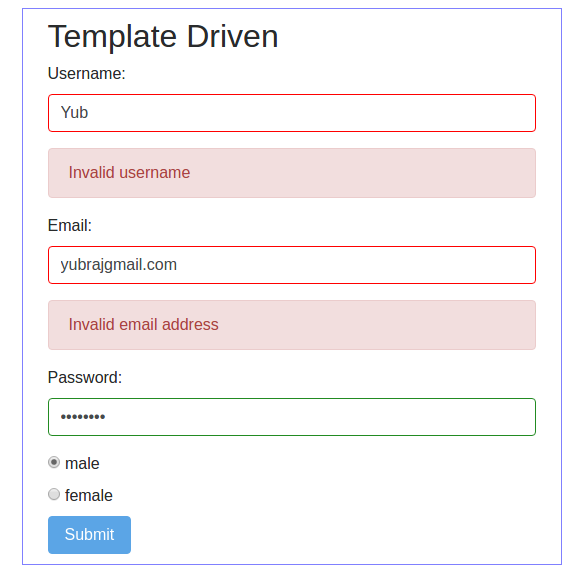 2. show errors in the forms. so we modify the class ng-invalid and ng-valid which is used to highlight the input field if the data is not valid. so once the input is invalid the border color will turn to red and on valid it will turn to green. Forms in Angular has always been so interesting. We can do lots of stuffs in the forms using a little and simple techniques in angular. Forms are very important in the web applications. Forms are used to login, registrations and also for many stuffs. Dynamic web is not possible without the forms. In angular 1.x we have seen how angular helps us in developing much user friendly forms. 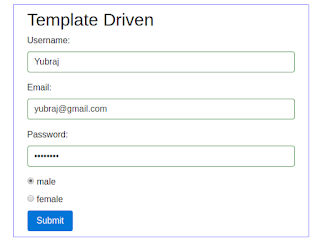 In angular 1.x all the forms are template driven where as in angular 2 we can also create a data-driven forms too which are much easier and easy to learn as well. Check it out the examples of each type of in the upcoming tutorials. Recently, I gave a technical interview one of the reputed software company in silicon valley. Here are the question and it's solution. Anagram is a word that can be obtained by rearranging letter of the another word, using all the constituent letter exactly once. This is the most interesting in the angular which makes our app super awesome. Using this techniques we can make our app single page application. In order to use this in angular 2 we need to use the @angular/router module. There are various steps to accomplish this feature in the angular app. here we are crating the routes as a constant value which stores all the routing information and is also ready to share with external elements using the export keyword. We have added this route information for the root using the forRoot(). so when ever we hit the root url the home componet will get called. similary if we hit url with /videos then the VideosComponent will get loaded and so on. Here the view will be loaded dynamically inside the <router-outlet> tag. Now if we run the application then we can see our router in effect. Here we can add extra attribute called routerLinkActive inorder to change the style for our active link. for this we need to pass the css class. 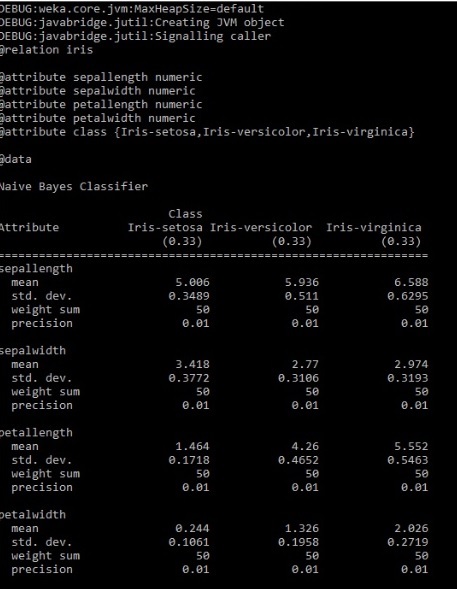 The Iris Dataset is a multivariate dataset. It has 5 attributes, the first one is sepal length (Numeric), second is sepal width (Numeric) third one is petal length (Numeric), the fourth one is petal width (Numeric) and the last one is the class itself. We have 150 rows that are equivalent to 150 flowers collected those flowers are divided into the different category. They are similar flowers that are Iris but the different category like Iris-setosa, Iris-versicolor, and Iris-virginica. It is important to know about these patterns because in future if you see similar data we can say that this data belong to the certain pattern. Based on these data, we can predict which kind of the Iris flower does new flower belongs. It is supervised data since we have the class (Nominal). 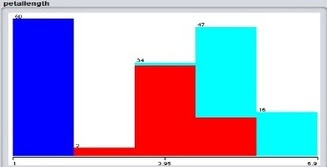 Data visualization: As we can see there are three classes. Blue (Iris-setosa), Red (Iris-versicolor), and Sky Blue (Iris-virginica). There are equivalently distributed so during the analysis we don’t have to normalize it. There is same frequency of data of all class. Now let us analyze petal length graph. We can distinctly analyze that if the petal length is from 1 to 2 then it is of Iris-setosa. Similarly, we can analyze others using attributes graph. Basically, the task is to assign a new data to one or more classes or categories is classification or categorization. Naive Bayes is a simple technique for constructing classifiers: models that assign class labels to problem instances, represented as vectors of feature values, where the class labels are drawn from some finite set. It assumes that the value of a particular feature is independent of the value of any other feature, given the class variable. For example, a fruit may be considered to be an apple if it is red, round, and about 10 cm in diameter. A naive Bayes classifier considers each of these features to contribute independently to the probability that this fruit is an apple, regardless of any possible correlations between the color, roundness and diameter features. From this Confusion Matrix, we found that 50 of data is Iris-setosa from the above chart. Then it was able to classify 48 separate ways with 2 errors for Iris-versicolor. For Iris-virginica, 46 were rightly classified and 4 of them were an error. * Created by yubraj on 11/6/16. BrowserModule : registers critical application service providers. 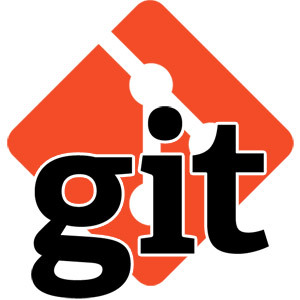 It also includes common directives like NgIf and NgFor which become immediately visible and usable in any of this modules component templates. @NgModule : It is imported from angular/core. Here we tell angular what is used in our app. declaration: What directives we have used in our app, Components are directives. It basically tells which componets should I use through out my application. imports: which other modules should I use. like browser module is used to use other default directives.